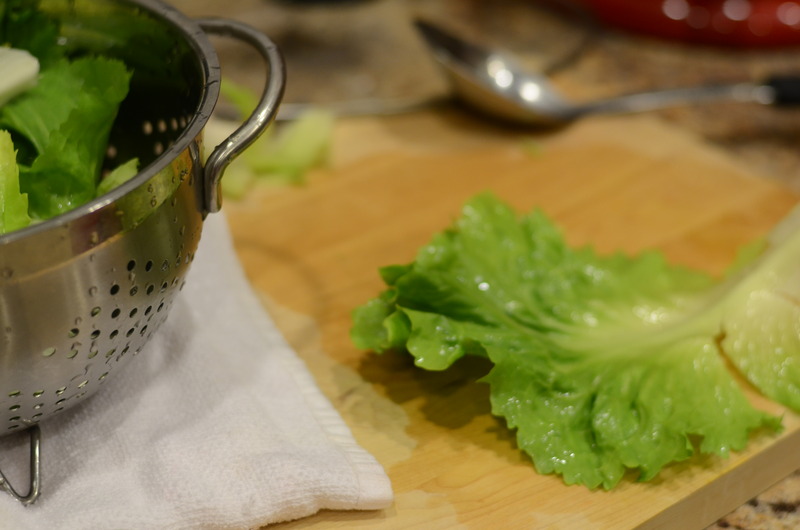 This recipe is brought to you by the letter E…for escarole. Escarole, that vegetable that makes me groan, because it tastes so bitter raw. Which means I have to make an E for effort to cook it, and when I do, I always feel the need to do something complicated instead of simply sautéing it. Yes, I know this is MY problem. I was surprised to discover that escarole is a fairly normal ingredient to add to Italian Wedding Soup. 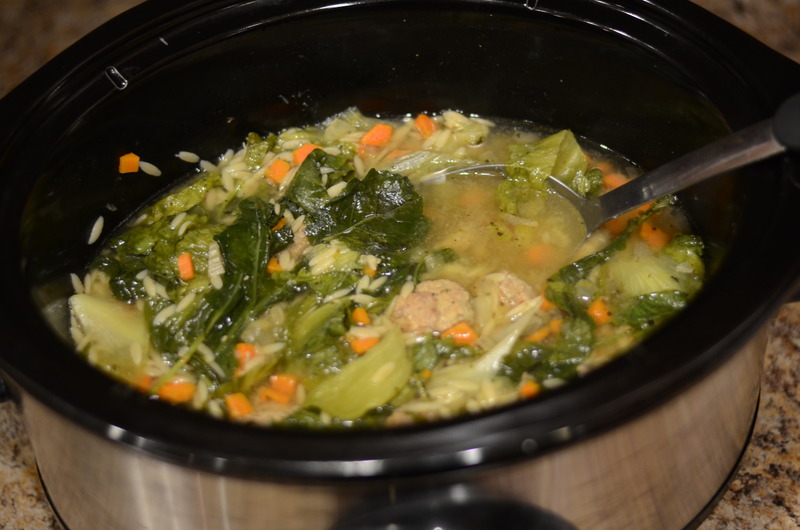 The Italian-Style Wedding Soup flavor of Campbell’s used to be one of my favorites as a kid. Yet I’m not sure I have had soup by the same name since then, and I had never made it at home. Of course, it is just a name, and there’s a good chance I have had a chicken-broth-based-vegetable-soup-with-meat-and-sometimes-pasta. 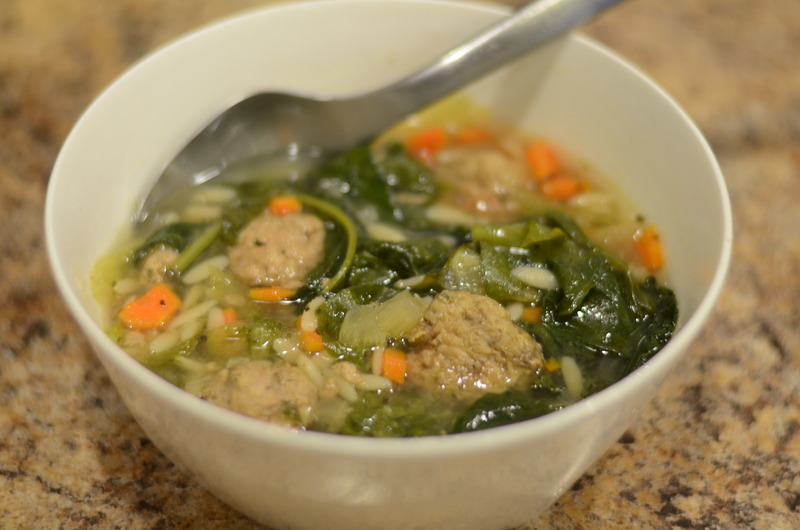 Did you know that “wedding soup” was a mistranslation, and the original Italian phrase actually meant “married soup,” because of how well meats and green vegetables marry together? Now you know. I really enjoyed how this came out using the slow cooker. The meatballs were so tender. 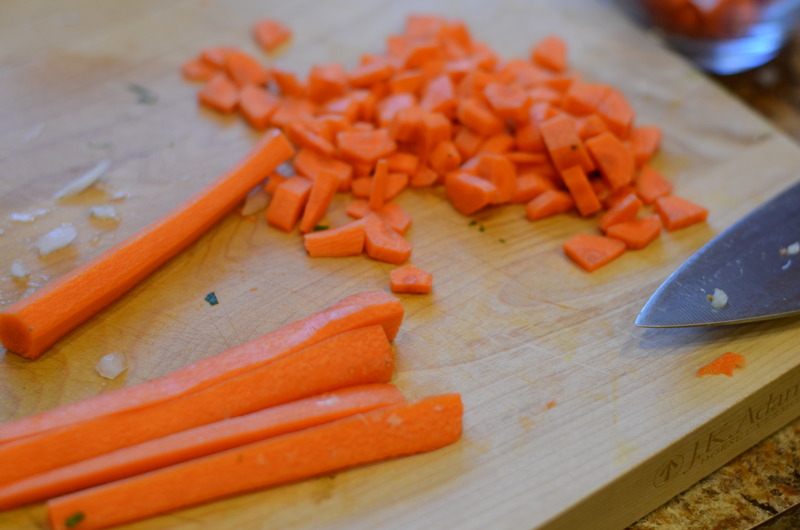 Each vegetable added something interesting to the overall flavor. And with the chicken broth base, it definitely came out tasting like comfort food. Because I only had 1 pound of ground beef instead of 1.5, I scaled most of the entire recipe down by 25%–including using 3/4 of my 2 beaten eggs. 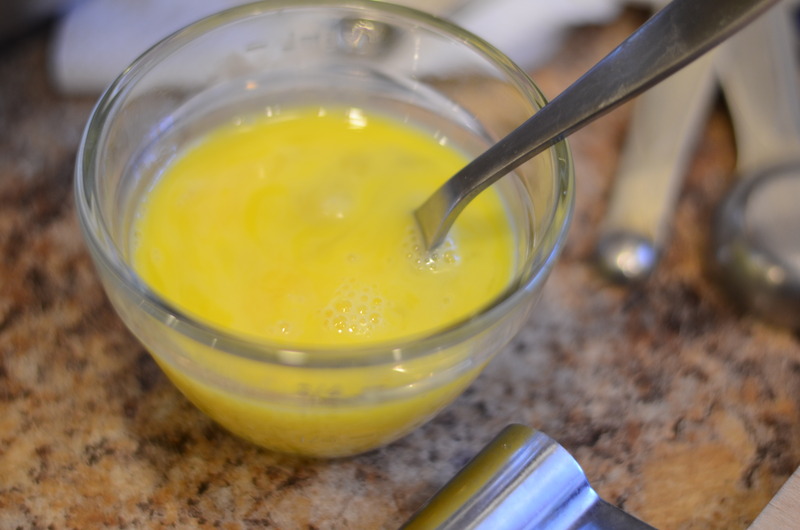 I’ll spare you that silly instruction on the ingredient list (I probably could have gotten by with just 1 egg). Besides keeping close to recommended ratios for keeping meatballs together, the recipe is, of course, flexible. If you increase the greens, like I did, be sure to compensate with added broth. 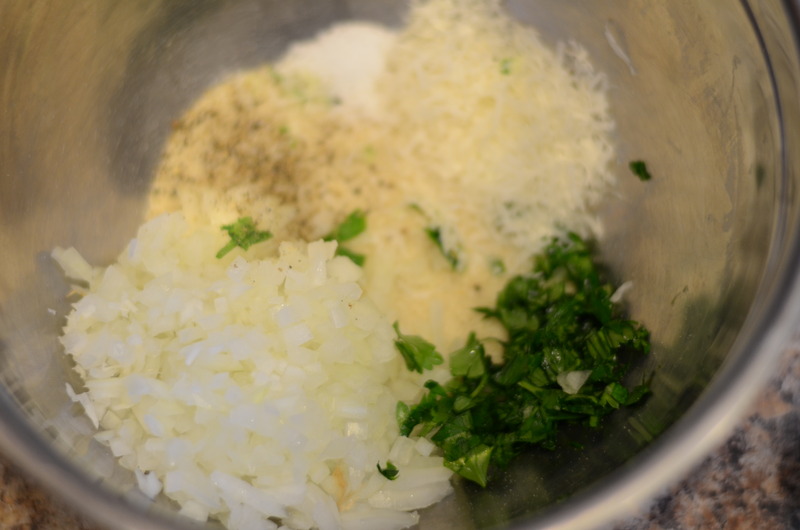 In a large bowl, combine eggs, onion, bread crumbs, cheese, parsley, 1/2 teaspoon of the salt, and 1/2 teaspoon of the pepper. 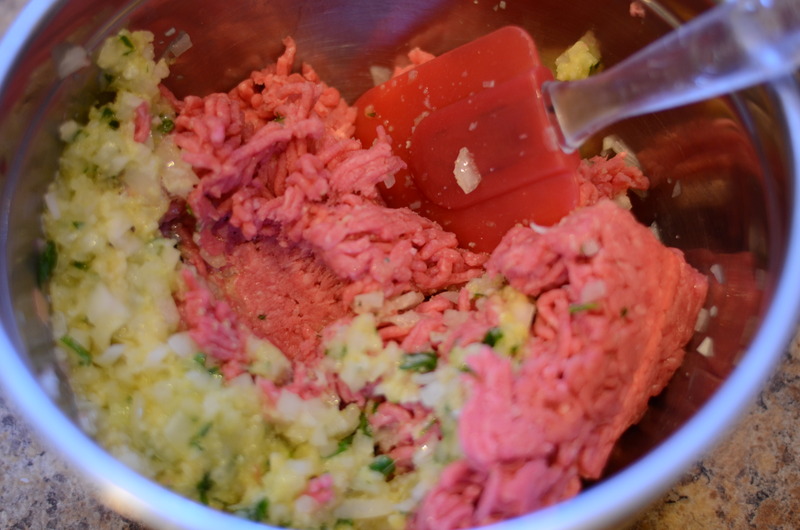 Add ground beef; mix well. 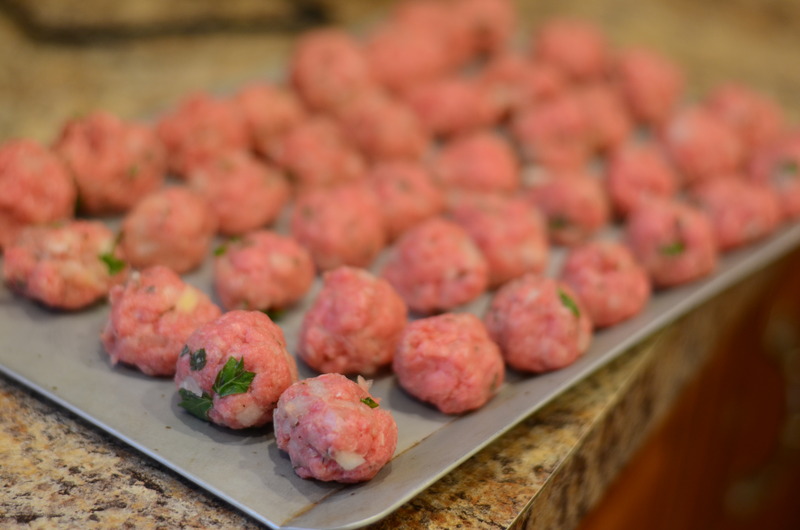 Shape mixture into about forty 1-1/4-inch meatballs. Now it is time to choose your method for browning the meatballs. One possibility is to use a large skillet, heat 1 tablespoon oil, and brown meatballs, half at a time, draining on paper towels. I tried this for the first half, and turning the meatballs was a challenge. It was much easier to bake them in oven at 350, turning once, for 10-15 min total. 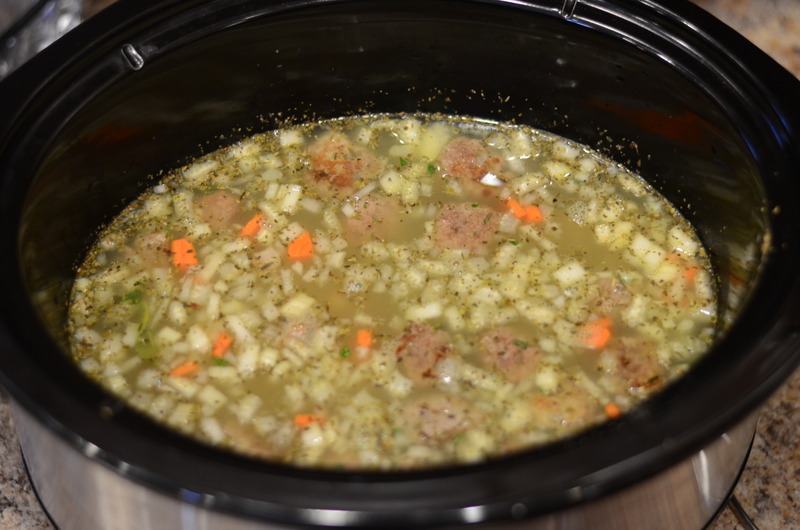 In a 5- to 6-quart slow cooker, combine broth, carrots, dried herbs and spices, if using (oregano, basil, garlic powder etc.) the remaining 1/2 teaspoon salt, and the remaining 1/4 teaspoon pepper. Gently add meatballs. 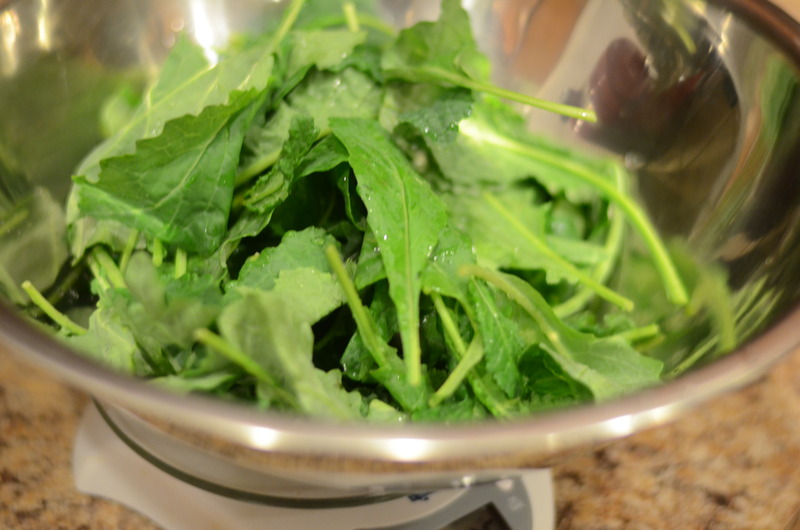 Cover and cook on low-heat setting for 6 hours, or on high-heat setting for 3 hours, stirring in fresh oregano (if using), pasta, and greens during the last 20 minutes of cooking. 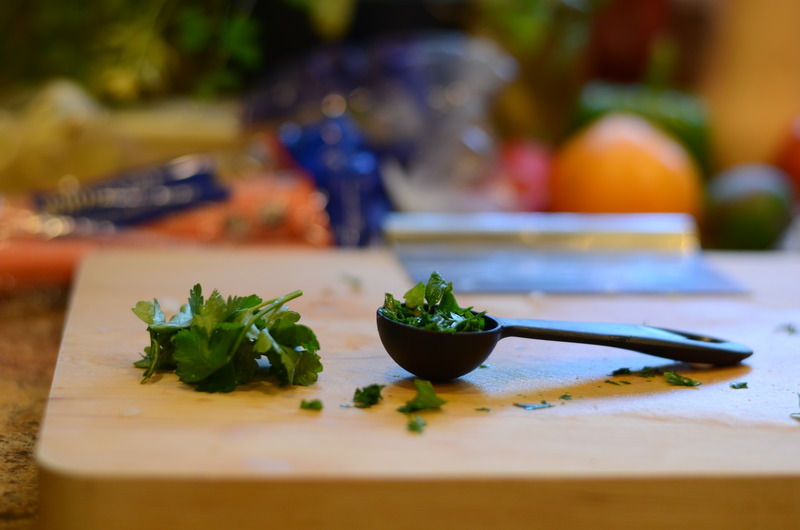 Ladle into bowls. Garnish if desired. Sit back and enjoy.